What Are Wisdom Teeth, and Does Everybody Have Them? "Wisdom" is the name given to the last, third molar teeth that historically grow into the mouth in the late teens or early adulthood. The eruption of these teeth was supposed to correspond to the arrival of maturity and wisdom. Generally everyone has them, although some people may be missing them. What Does "Impacted" Mean, and Why Do These Teeth Get That Way ? When wisdom teeth are "impacted", they are trapped in the jawbone, unable to grow in like the other teeth. They may be lying at a number of different angles, and may be completely enclosed in bone or partially erupted or exposed in the mouth. The reason that wisdom teeth become impacted is that there is not enough room in the back of the dental part of the jawbone for them to grow in straight. Jaw size is genetic, but humans' jaws are generally getting smaller because of our softer diet compared to our ancestors. Why Do Wisdom Teeth Need to Be Removed ? Decay or erosion of adjacent teeth - A wisdom tooth that is leaning up against another tooth may create a trap for food debris and bacteria - the perfect recipe for decay of either or both teeth. Also, pressure from the wisdom tooth can cause erosion (resorption) of the 2nd molar tooth. 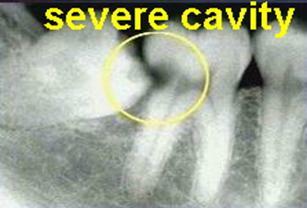 This can be disastrous to the 2nd molar since the decay often moves slowly and is found at advanced stages. Repeated gum infections around partially exposed wisdom teeth- When these teeth are partly exposed to the oral environment, food debris and bacteria will be able to collect in areas that are impossible to clean. Localized infections or abcesses can happen over and over again around the gums or even deeper in the bone around the tooth. 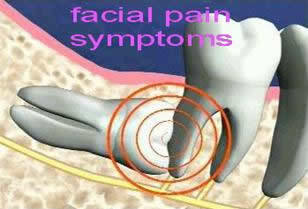 Facial pain symptoms - An unerupted tooth can put pressure on the crown or the roots of the adjacent tooth. This can cause periodic episodes of pain that may be localized, more vague, or even travel in different directions. 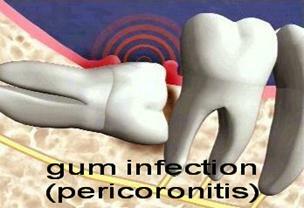 The pain is related to the close confines of the impacted tooth and its neighbour. 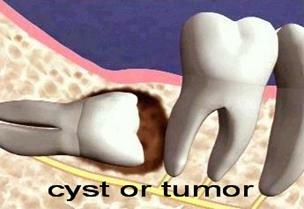 Cysts or Tumors - In rare cases, cysts or tumors can develop around impacted molars. These lesions can grow to be quite large, eating away at the normal bone tissue. This often develops and progresses without any symptoms, and may not be detected until something bad happens like pain or jaw fracture. If one chooses not to have his or her wisdom teeth removed, it is important to have the Dentist or Oral Surgeon, periodically assess the teeth with x-rays. When Should Wisdom Teeth Be Removed ? Generally, the younger the patient (early teens), the easier the procedure, and the faster the healing period. In the early to mid "teen" years, the roots of the wisdom teeth are not fully formed. This makes them easier to remove, with less trauma to the surrounding hard and soft tissues. As people age, the bone gets denser and harder, making removal of wisdom teeth more difficult . As well, the younger the patient, the greater and the faster the healing capacity will be. People should have screening x-rays between the ages of 14 and 16 to determine the exact location, position, and development of the wisdom teeth. Who Can Take Out Wisdom Teeth ? 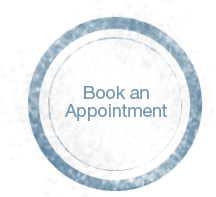 A General Dentist is trained to remove all kinds of teeth. By virtue of additional training and experience, as well as personal preference, some Dentists choose to do many cases while others refer their patients to an Oral Surgeon. An Oral Surgeon is a dental specialist with a high degree of education an training relating to removal of teeth and jaw surgery. General Dentists usually refer their patients to the specialist when the case is more difficult or the patient wishes to have a deep sedation or general anesthetic for their procedure. Do I have to be awake for the procedure, and what will I feel if I am not ? Some people do not mind being aware of the entire procedure, while others do not want to experience any part of it. There are various forms of sedation available. Most Dentists are comfortable using nitrous oxide (conscious) sedation or oral sedation using medicine such as Valium. The Oral Surgeon has the special training to use deep (intravenous) conscious sedation or even a full general anesthetic. Removal of any teeth is done with proper "freezing" (local anesthetic). This is so that there is little or no sensation during the procedure. When teeth are being removed with local anesthetic only, one might have the occasional sensation of movement, pressure or vibration.